"Welcome to Lollipop: sweet taste match3! 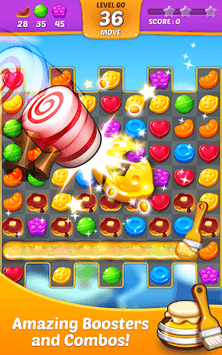 Rake your way through a storyline full of unexpected twists to collect the sweetest lollipops from the challenging adventures!" 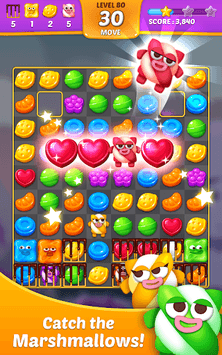 "Beat addictive match-3 levels to collect lollipops, unlocking ever more chapters in the exciting sweet world. What are you waiting for? Help your friend Jenny to collect candies from the exciting challenges!" ● Unique gameplay: swap and match, help Jenny to collect the candies from every single challenging levels. ● Different areas in the Lollipop world with unique structures: Fudge desert, candybean bay, and many more. ● Fantastic characters: interact with each other in the in-game. ● Check back often for free rewards and new levels! 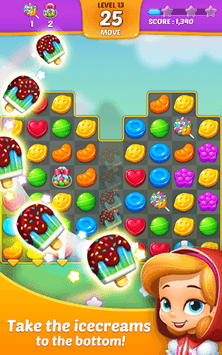 "Lollipop: Sweet taste match 3 is free to play and available on both tablets and phones but, you can purchase in-app items like Ads Free and coins with real money. In addition, Lollipop allows you to link to social media services such as Facebook, which is optional."